I’ve written a great deal for people of an intermediate to advanced experience level, but this time I’m offering something for a more general audience, to include people who may never have even heard of totems before! I’ve taken my totemic practice of 15 years and broken it out into three different working models of animal totemism. The Correspondences Model takes the idea of totems of the four directions further, explaining how to mesh animal totems with any of a number of personalized correspondence systems, whether pre-existing or self-created. The Archetypal Model draws on Jung’s original conception of archetypes as symbolic expressions of internal impulses and instincts, linking the internal landscape with external animals as living symbols. The Bioregional Model connects people to the totems of their local area, as well as the Land itself. To give readers, especially those new to totemism, some guidance, I’ve offered a variety of exercises, meditations, and ritual ideas to play with along with the theory. And to illustrate the material further, there are examples seeded throughout the text. However, as with all my books, there’s plenty for the more experienced practitioner to play with, and none of it is strictly “by the book”, as it were. AND, for those of you who have read my previous works, there’s plenty of new material and ideas to work with! 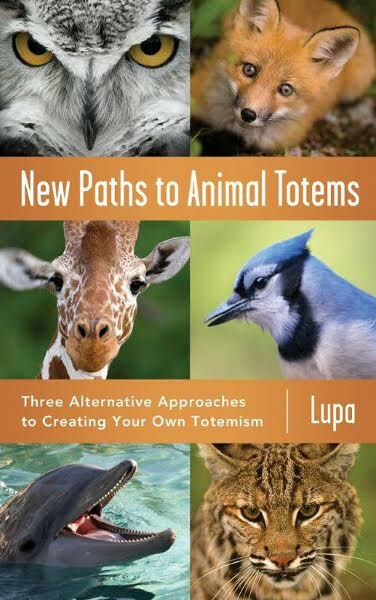 An autographed copy of New Paths to Animal Totems is available for $16.99 plus priority shipping in the U.S.
An autographed copy of New Paths to Animal Totems is available for $16.99 plus media shipping in the U.S.